"I ain't sure what they want, but they ain't nice." 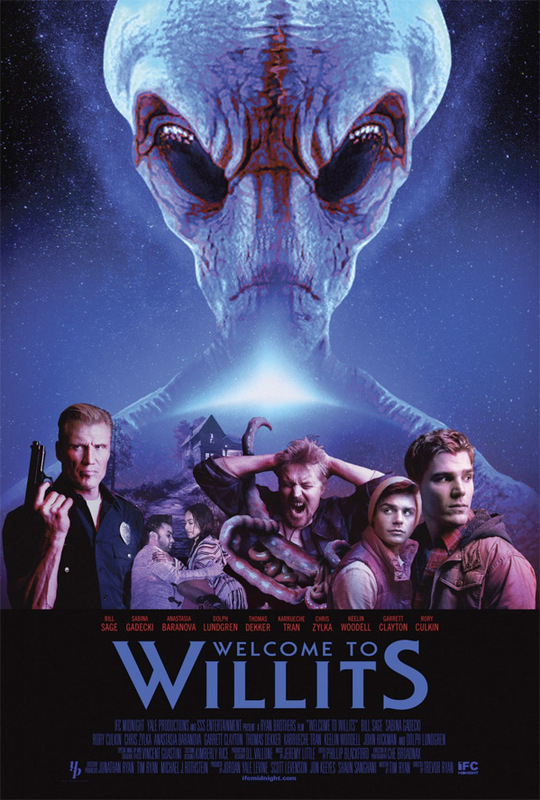 IFC Midnight has unveiled an official trailer for a sci-fi horror film titled Welcome to Willits, which played at various genre film festivals all last year. Set in the woods of Northern California in an off-the-grid town called Willits, a "haven for marijuana growers, meth addicts, and conspiracy theorists", the story is about a group of teens who get mixed up with a local pot farmer. And then the aliens show up and all hell breaks loose. This is described as a "no-holds-barred pileup of carnage, twisted comedy, and pure crazy." Let's hope all of that is true. Starring Bill Sage, Rory Culkin, Anastasia Baranova, Garrett Clayton, and surprisingly enough, Dolph Lundgren. I don't think I've seen a film that mixes drugs and aliens in this way, can't say it's going to be a good combination. Watch out. Deep in the Northern California woods, in the heart of the notorious Emerald Triangle, lies a remote cabin. The residents struggle to fight off the repeated attacks and abductions by mysterious creatures that have plagued them for years. When a local pot farmer is caught up with a wayward group of campers the situation quickly escalates into total carnage. Welcome to Willits is directed by filmmaker Trevor Ryan, making his feature directorial debut after a number of short films. The screenplay is written by Tim Ryan. It's adapted directly from Trevor Ryan's own short film Welcome to Willits: After Sundown from 2013. This first premiered at New York City Horror Film Festival last year. IFC Midnight will release Ryan's Welcome to Willits in select theaters + on VOD starting September 22nd this fall. Anyone want to watch this one?